One important way to improve water quality in lakes and rivers is to ensure that there is a natural buffer of vegetation along the shoreline. Natural and vegetated buffers are some of the most productive and diverse habitats on the planet. Vegetated areas are also important for filtering contaminants and sediments before they enter the lake. Deep rooted trees and shrubs help to capture nutrients moving from the surrounding landscape. Shallow rooted vegetation such as grass lawns, are unable to capture these nutrients with the same effectiveness as their natural counterparts. A well vegetated shoreline can capture sediment before it is able to enter the lake and potentially affect water quality and lake bottom habitat. Keep in mind that even a small area with native plants will help. If you have grass to the lake - simply stop cutting all or part of it and nature will re-naturalize the area over time. 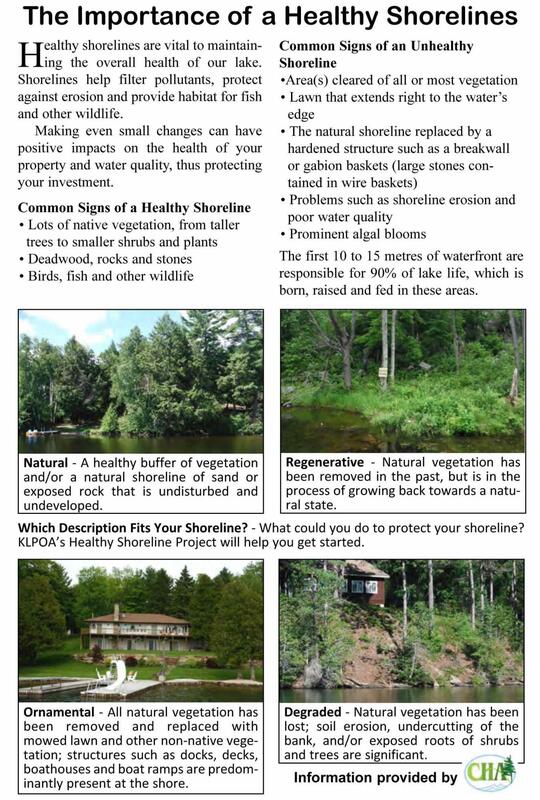 Waterfront property owners have a role to play in keeping their shorelines healthy. This video provides practical information for anyone in Ontario seeking to use best practices on their waterfront. The “Ribbon of Life” connects the dots between healthy shorelines and lakes we can enjoy for generations. What Type of Shoreline Do You Have?